streetcars | Park View, D.C. I recently found this snapshot of lower Georgia Avenue dated December 12, 1943. According to the writing on the back of it, it shows Capital Tranist car #1334 at the Georgia Avenue plow pit. Back when Washington had a citywide streetcar system, the areas outside of the original city used overhead wires. When cars reached the point where they switched to overhead operation, they stopped over a plow pit like the one shown on Georgia Avenue where the conduit plows were detached and the trolley poles raised. The reverse operation occurred on inbound runs. The photo above shows a northbound streetcar, so it is in the early stages of switching to overhead operation (the pole has not been raised yet). It’s also interesting to see the Wonder Bread factory in the background, which was originally Corby Bakery. The building today is known as Wonder Plaza. 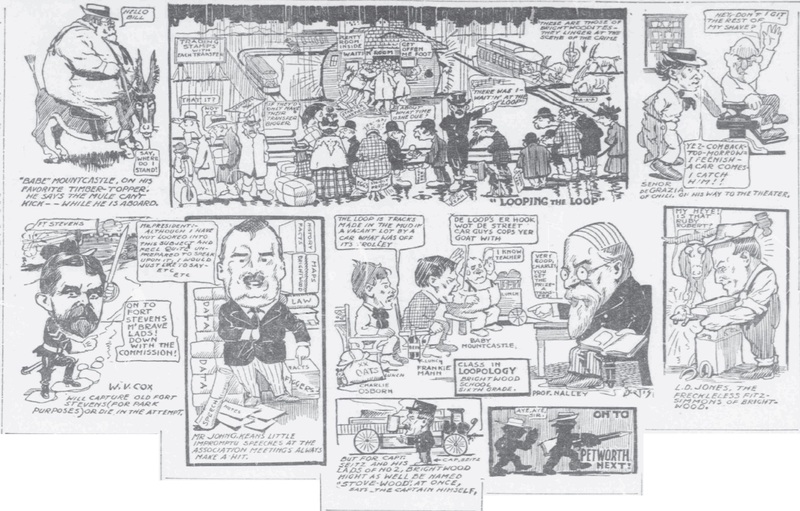 I’m continuing to re-post a series of articles that were originally published in the Washington Times that paint caricatures of various Washington suburbs as they were in 1908. I’ve previously posted the articles for Georgetown, Anacostia, Tenleytown, and Brookland. Today’s feature is Brightwood. “Better Car Service” Is Constant Appeal of Its Inhabitants. Weights 437 Pounds, But Isn’t at All Sensitive About Being a Prize Winner. 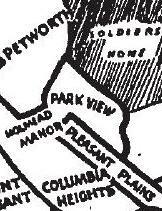 MORE Brightwood folks have “looped the loop” than those of any other suburb on the map. Do not gather from this that Brighhtwood harbors a miniature Coney Island with its chutes, merry-go-roungs, mystic mazes, wild men and loop-the loops. Far be it from me to act as press agent for the village and spring a yarn like that. ‘Tis a sadder tale than this that duty bids me tell. THE LOOP, to which I refer, and to which every Brightwoodite refers at least eighty-six time per day, is situated just to the west of the National’s ball park. Tenderly speaking, it is a place where all folks going to and from Brightwood are dumped out around a little station house and made to transfer – after waiting awhile for the next car. No man out that way feels at ease unless he has a transfer in his hand. So common are transfers in Brightwood that they are almost used for legal tender. Children cry for them and beg to loop-the-loop when they should be thinking only of leap frog and mumble-peg. Transfers are used as paper chest protectors, as lamp shades, for wall papering or to stop up the chink when the neighborhood bad boys break out the window pane. Occasionally we would also see that Brightwood demanded better lights along its avenue, wider roads in Rock Creek Park, more sewers, and a few other things. 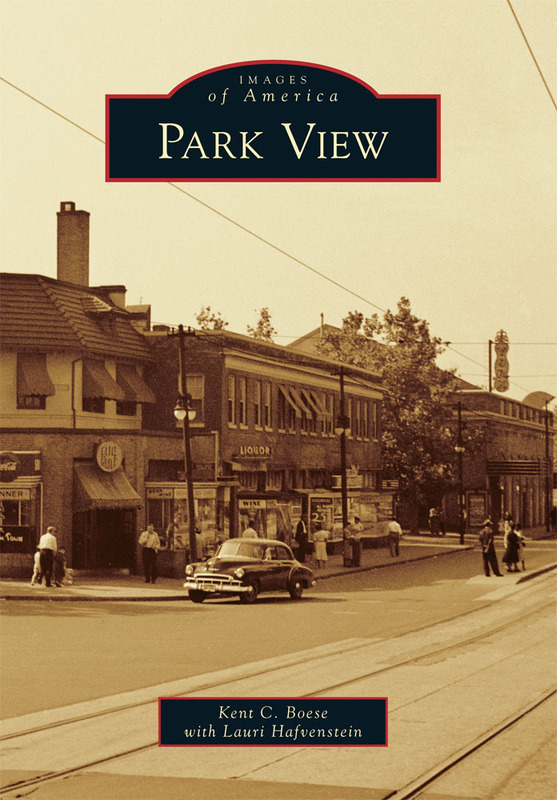 Whereat we have become accustomed to sympathizing with Brightwood because everybody knows that a lot of wide-awake people live out there and that the suburb itself is a delightful one – after you get there and when you get there. In inviting a friend out to dinner, however, the Brightwood citizen impresses upon you that his hospitality does not begin until after you have reached the confines of the village itself. He takes no responsibility for the street car service and the means of getting there. “Constance, I will bring my old college chum, Mr. Grouch, out to dinner tonight. Have something nice, will you? Wherefore, the real head of the household will bestir herself for some hours and have a steaming repast ready at the appointed moment. After a wait of some two hours or more, perhaps she hears a familiar footstep and indignantly rushes to greet the tardy one. Two bedraggled, dispirited specimens meet her glaring gaze. There is a moment of tense silence and then she tenderly takes their dripping coats and sends the specimens themselves into the spare room to dry. There are no words spoken. Words are not necessary for any wife would know that the car hadn’t shown up and that it rained and that hubby had “looped-the-loop” again. No wonder therefore, that each meeting of the citizens’ association is so replete with fervid oratory that the windows have to be raised even on the coldest night, and no wonder that when you speak the name of President George H. Harries out in Brightwood you are welcomed as you would be in Ireland if you shook a red bandana handkerchief and shouted “Long live the King.” General Harries, as everybody, I presume, knows is president of the street railway company that furnishes, or fails to furnish, transportation to all the folks out Brightwood way. General Harries’ name is conjured with at almost every meeting of the association and if it had been a punching bag would have been smashed to smithereens long ago. While on the whole I found that the people seemed more contented out in Brightwood than I really thought they had a right to be, I located one gentleman who seemed especially delighted with everything. In reality, I believe he’s too fat to get mad. I refer to “Pop” George C. Mountcastle, proprietor of that famous hostelry “Old Brightwood Hotel” and also proprietor of 437 pounds of good, hard flesh. “Pop” is a character in whose company one might spend many a joyous hour. He says he’s also nick-named “Beefy,” but I didn’t hear the boys call him anything but “Pop,” especially when they wanted to borrow a half-dollar or stand off the bar-keep for a round. The final round of meetings for the first phase of the North-South Corridor Planning Study are scheduled to begin next week (see flyer below for locations and times). As I understand it from other meetings I’ve attended, the from the previous meetings is definitely in favor of streetcar service. There is still some question about the alignment in our area. Currently both Sherman and Georgia Avenue are on the table. What will be interesting will be how the DC Council’s recent vote to reduce planned spending through 2021 from $1.4 billion to $730 million may impact the discussion. At the end of last week, DDOT added the presentation materials from their February public North-South Streetcar meetings to their online library. As a follow up to my previous post, I wanted to make sure residents interested in this initiative were aware of these materials and had an opportunity to review the information prior to the third series of meetings, which are currently scheduled for June 2014. Below is the meeting’s presentation slide deck and more images from the presentation boards. 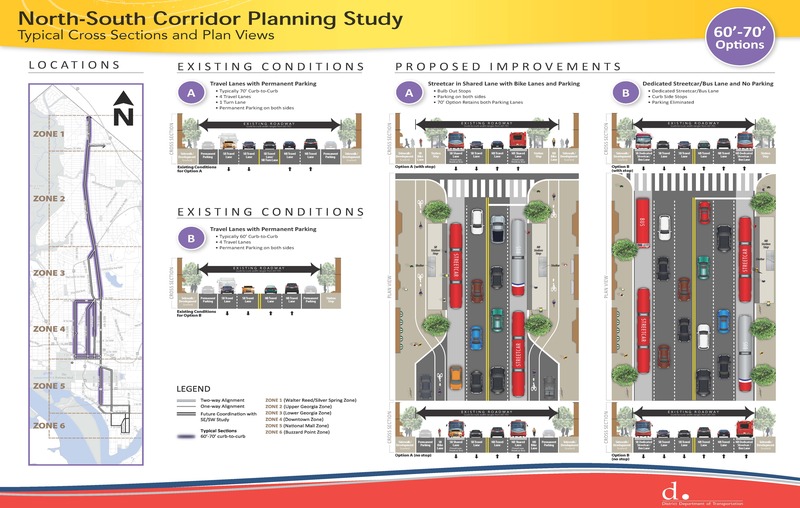 The boards showing potential street cross sections should be of particular interest to the community, as they suggest how the streetcars could be laid out on particular streets — which also suggests how they could impact parking or bike lanes. 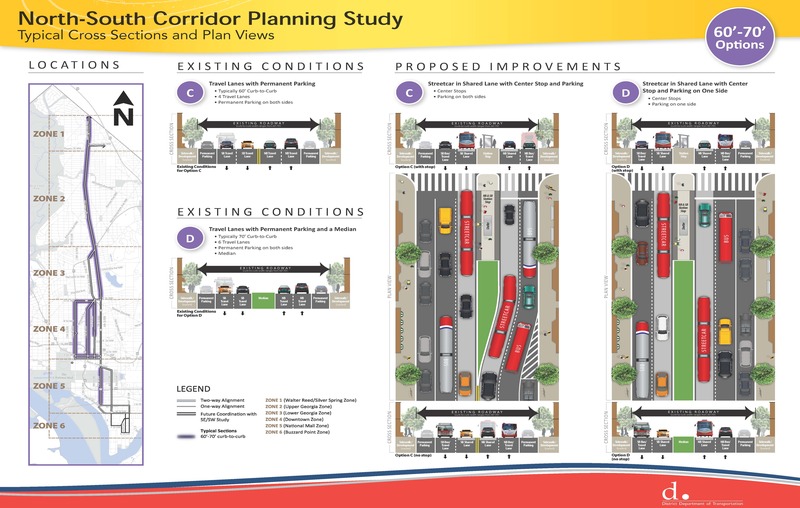 There were several options shown at the public presentations so that DDOT could get community feedback. I suspect that the options will be narrowed down with fewer options by the third round of public meetings. Below are scenarios A & B. … and below are scenarios C & D.
… and lastly, the video below of streetcar simulations and videos from various US projects were shown during the second series of public meetings for the North-South Corridor. In these meetings, DDOT examined potential conceptual alignments for the streetcar. 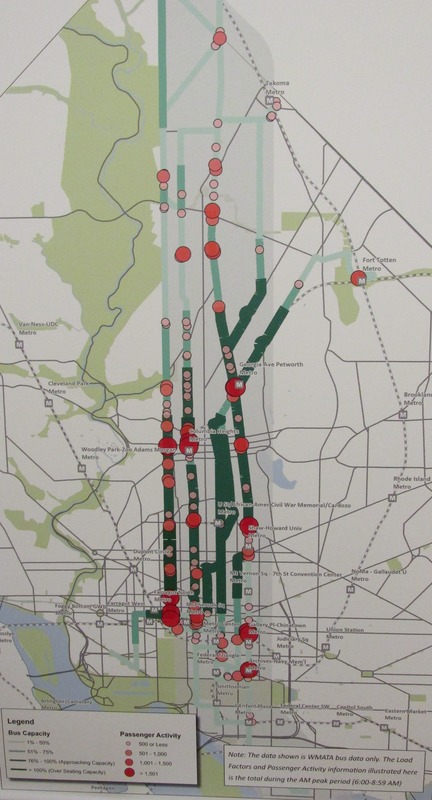 This map from the presentation indicates ridership volume and most heavily used stops. After attending last night’s North-South Corridor Study at Banneker Recreation Center, I wanted to share a few notes and first impressions while they are still fresh in my mind. If you didn’t attend, but want to, there is a final meeting tonight at Emery Recreation Center – 5701 Georgia Ave NW – from 3:30pm-8:00pm. Presentations will be at 4:00pm and 7:00pm. The current round of meetings are the second of three rounds, with the final series currently planned for around June. The first round was in November and was very general in its approach. It focused on streetcars and buses, along with a variety of corridors. The stated purpose of the corridor study is to evaluate reliable and comprehensive improved transit service in the North-South corridor and support existing neighborhoods and future growth in and along the corridor. 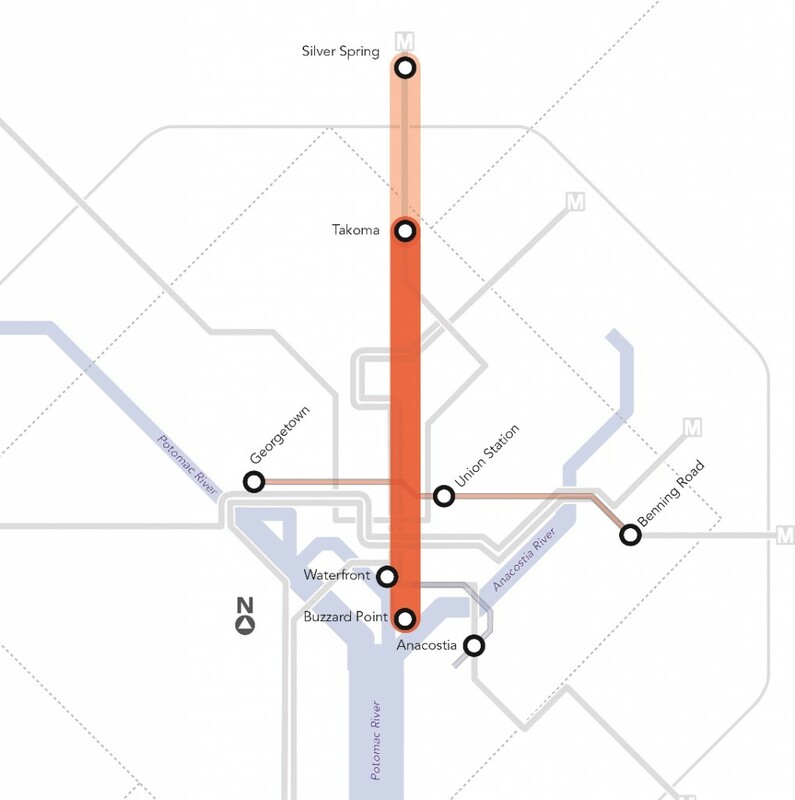 The corridor in question is the 9-mile corridor from Takoma/Silver Spring to Buzzard Point/Southwest. Since the first meetings, and with the above in mind, a few decisions have been made (although there are still many more that need to be made). First off, it definitely looks like DDOT has settled on streetcars as the mode of transportation. Based on the data of ridership in the corridors now and the population projects in the coming years, the streetcar option provides the better scenario for capacity and reliability. Provide a higher quality of service. There were a couple of things I found interesting in looking at the various information boards. The first was a map showing ridership volume and busiest stops (see map above). In looking at 16th and 14th streets vs. Georgia Avenue, 16th and 14th streets have a ridership that suggests that they support more commuters and the Georgia Avenue data suggested more local traffic. This ridership pattern suggested that the future streetcar route should be on or near Georgia Avenue. Some streetcar routes still being considered. Other routes were discounted because they were considered to have fatal flaws (constructability, grades, turns, & tunnels/bridges) . 14th Street, for example, already has a horrible traffic intersection at the intersection of Monroe and 13th Street has a grade by Cardozo High School that is too steep for a good streetcar line. North of New Hampshire Avenue, Georgia Avenue is definitely the route with only the end in question (Takoma or Silver Spring). In our area (Zone 3) both Georgia Avenue and Sherman Avenue are on the table. Due to the new streetscape along Sherman, and the higher volume of traffic on Georgia, I favor Georgia over Sherman. Roughly at Florida Avenue, four different possible routes come in to play. Of these, I think the 14th Street option is the best, followed by the 11th Street option. Either would bring much needed transit to an area not well served by Metrorail. I favor the 14th Street option more because it would serve more of U Street and I think that is important. 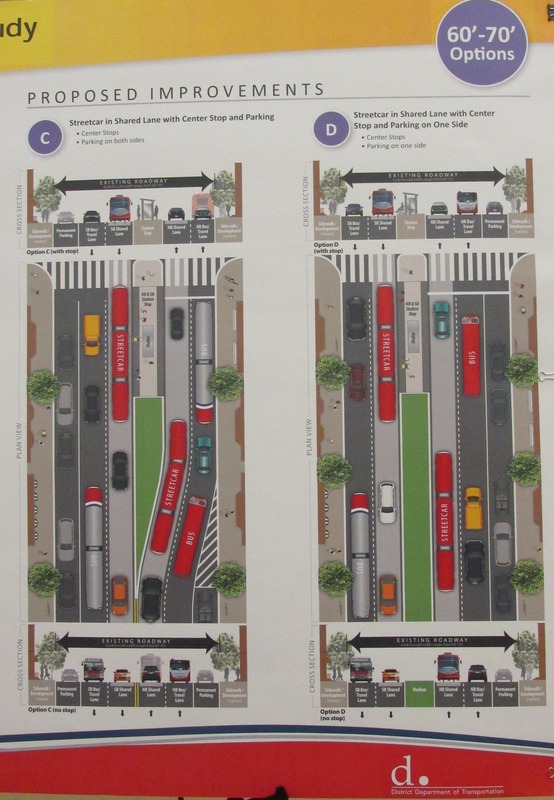 Lastly, parking and traffic configurations still need to be figured out. There were several boards that illustrated possible traffic patterns with a streetcar system in place. Some of these included parking, others did not. None were being presented as what DDOT will be doing, but rather as options to get attendees talking about what they liked or didn’t like. As for me, I think there is definitely room for both streetcars and parking south of Florida Avenue and north of New Hampshire Avenue. I’m still uncertain about the Florida to New Hampshire section of Georgia Avenue. I know parking is an issue with some, but I also know that increased transit capacity is critical with a growing city and new residential developments continuing to come to Georgia. I’ll post the slide deck from the meetings once it is publicly available. 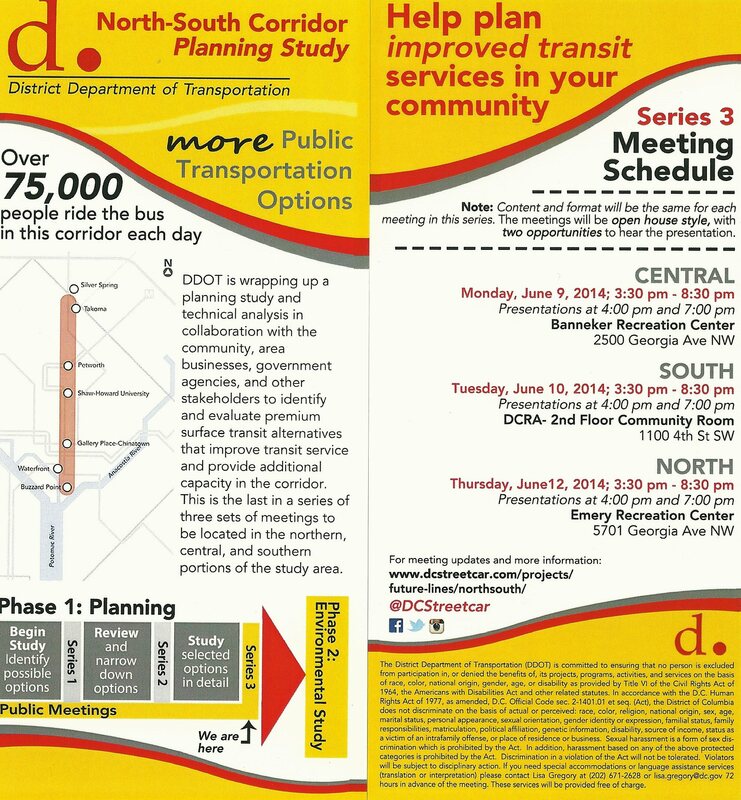 DDOT’s second series of public meetings related to their North-South Corridor Planning Study begins today. The meeting for our area will be at Banneker Recreation Center tomorrow, with presentations at 4:00 p.m. and 7:00 p.m. The District Department of Transportation (DDOT) is in the middle of a planning study to examine opportunities for public transportation improvements in the North-South corridor through DC. Over the next year, DDOT will be working in collaboration with the community, area businesses, government agencies, and other stakeholders to identify and evaluate above-ground, high quality transit service. The study area is focused on a 9-mile, North-South corridor that connects the Takoma/Silver Spring area to the Buzzard Point/Southwest Waterfront area. The study area extends east to west from about 16th Street on the west to approximately one-quarter mile east of Georgia Avenue. Meetings will be open house style with two opportunities for residents to hear an overview presentation. Each meeting will cover the same information, so feel free to attend any of the meetings that fit into your schedule. Wednesday, February 19, 2014; 10:00am-12:00pm. Click here for a recap of Public Meeting Series #1. The District Department of Transportation (DDOT) has scheduled their second round of public meetings to examine opportunities for public transportation improvements in the North-South corridor through DC for February 18th, 19th, & 20th. The meeting in our area will be held at Banneker Recreation Center (2500 Georgia Ave.) on February 19th. Presentation times are set for 4 pm and 7 pm. If you can not make this meeting, all the meetings should be similar so feel free to attend the meetings that fit into your schedule (flyer here). 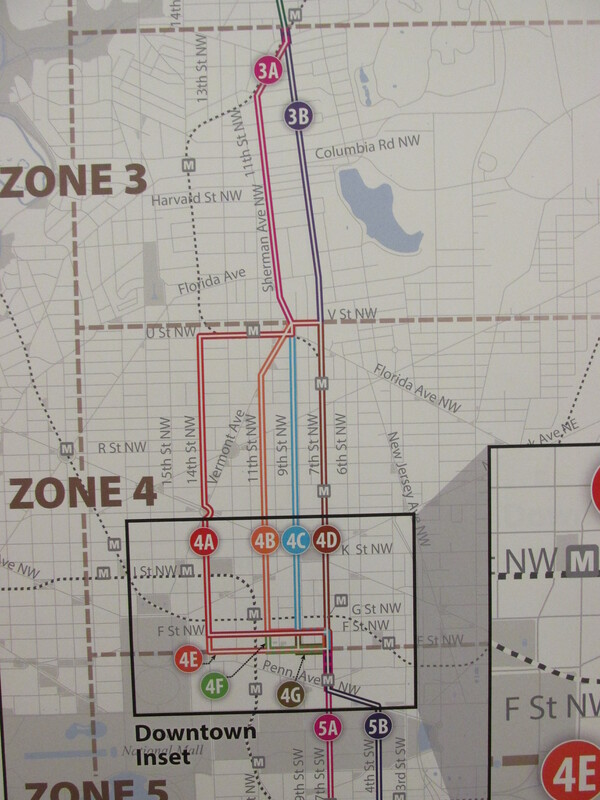 DDOT held their first round of public North-South Corridor meetings in November 2013 (my review and opinions of those meetings here). Community involvement and feedback is essential to helping DDOT and other partnering entities plan, build and operate the best streetcar system possible. For more information about this study please visit North-South Corridor Planning Study (http://www.dcstreetcar.com/projects/future-lines/northsouth/) or contact Jamie Henson at 202-671-1324 or Jamie.Henson@dc.gov (mailto:Jamie.Henson (at) dc.gov) . To join the project distribution list visit http://www.dcstreetcar.com/connect/.